Have you ever seen that person in the grocery store? You know the one: she carefully screens each item before placing it in her shopping cart, runs her finger over the nutrition panel, compares five different brands of the same product, and breaks everything down into protein, carb, and fat content to decide if it fits her macros. I am that person. Some might call me obsessive or eccentric, but I think I have good reason to be mindful of what makes it home from the grocery store. After all, what's more important than what you put in your body? If you think about it, any food that requires a label has been altered from its natural state. In other words, it's been processed. One quick look at the ingredient list and you'll often find hard-to-pronounce additives, artificial flavors and colors, and those ever-elusive names like BHA, BHT, MSG, and HFCS. You might start to wonder what these weird additives are or, more importantly, if they're safe. Unfortunately, just because the U.S. Food and Drug Administration (FDA) says something is "generally recognized as safe," doesn't mean it promotes optimal wellness. Protect your body and mind with this list of food additives to avoid! We all love sweet flavor without the extra sugar, but the truth is anything but sweet! You might find aspartame or acesulfame K in your favorite "sugar-free" treats, but it's not worth the calories saved. Watch your labels for "acesulfame-K," too. This chemical is often added to Aspartame and other low-calorie sweeteners to reduce aftertaste. Acesulfame-K contains methylene chloride, a known carcinogen, which has undergone the least scientific scrutiny of all artificial sweeteners. Is sweet without the calories worth it? Not in my book! Common food sources: Diet sodas, sugar-free beverages, Jell-O, sugar-free gum, artificial sweeteners (NutraSweet, Equal), some cereals, breath mints and chewing gum, pudding, flavored yogurts, Kool-Aid, iced tea, chewable vitamins, toothpaste, even many pre- and post-workout supplements! When compared to table sugar, high-fructose corn syrup really isn't much different in terms of calories and basic chemical composition. Both are about half fructose and half glucose. Does this mean that the whole "anti-HFCS" campaign was a bunch of hype and you should start drinking soda by the liter? Not so fast. 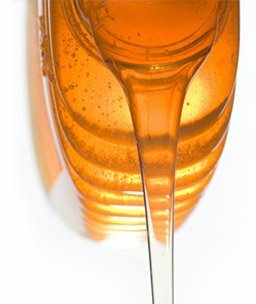 Honey contains natural fructose, a sugar. It's not as bad as HFCS, but it's not exactly a health food. Why to avoid it: Consuming large amounts of fructose is damaging to both your metabolism and your overall health. Because fructose doesn't stimulate insulin the same way glucose does, too much fructose promotes insulin resistance in the muscles and the liver.7,8 Insulin resistance means your body cannot store sugar the way it should. Blood sugar stays high and fat storage is accelerated, sending you down a path to weight gain, obesity, and type 2 diabetes. Do you still need motivation to cut HFCS from your diet? With fructose, 30 percent more of the calories consumed are stored as fat compared to glucose. Fructose also fails to stimulate leptin, the "satiety hormone," to the same extent as glucose does. The end result: you don't feel as full and end up eating more. Worried about your waistline? Consider your heart, kidneys, and liver! A high-fructose diet lowers HDL (good) cholesterol, raises LDL (bad) cholesterol, elevates blood pressure, and places additional stress on the kidneys. These fatty acids accumulate in the liver, setting the stage for liver disease. Keep in mind, natural sources of fructose are far less concentrated than artificial sources, like HFCS. Natural fructose is found in fruits, fruit juice, some vegetables, sugar cane, and honey. These foods contain vitamins, minerals, enzymes, and healthy phytonutrients that are metabolically beneficial when consumed in moderation (1-3 servings per day). Common food sources: High-fructose corn syrup (HFCS), table sugar, agave nectar (yep, it's highly processed! ), maple syrup, flavored yogurt, breads, candy, condiments, salad dressings, canned vegetables, cereals, and infant formula. Trans fat comes from a process called hydrogenation, which makes the oil less likely to spoil and less "greasy" to the touch. Why to avoid it: Trans fat raises LDL (bad) cholesterol levels and lowers HDL (good) cholesterol levels. The result: Clogged, hardened arteries that put you at risk for heart disease and stroke. Trans fat also causes overall inflammation, hastening the progression of diabetes and other health problems. Thankfully, the FDA now requires all food nutrition labels to specifically list trans fat content. The official recommendation for consumers is to limit your intake to less than 2 grams per day. So, you're thinking, just check the label and everything's fine, right? Think again. Manufacturers are allowed to say there is no trans fat in their products as long as they contain less than 0.5 g per serving. This means four servings of your favorite "trans fat free" margarine could put you over the daily limit without you even suspecting a thing! The best way to avoid trans fat is to look for "partially hydrogenated oil" in the list of ingredients. Fully hydrogenated oils don't contain trans fat. Let's face it, most "artificially colored" foods are low in nutritional value and highly processed, so it makes sense to take them off the menu completely. For those of you who need more convincing, read on. Why to avoid it: Artificial food colorings have been implicated in the development of autism, hyperactivity, and behavioral disorders in young children.9,10 Animal studies have shown certain artificial colorings to be potential carcinogens, causing chromosome mutation, neuron damage, even the development of tumors. 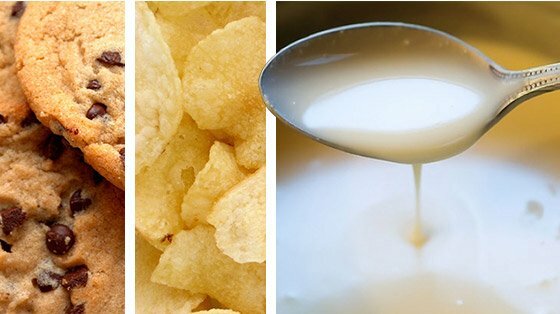 Many European countries have already banned these nasty additives! Artificial coloring may be linked to unhealthy side effects. Processed foods often contain these additives to return foods to their "original" color. Even caramel coloring contains compounds that have been labeled "possibly carcinogenic to humans" by the International Agency for Research on Cancer, yet caramel coloring remains the most widely used food coloring on the market. If you spot any of the following dangerous additives in an ingredient list, leave that item on the shelf! MSG is commonly used as a flavor-enhancer to make foods taste more "savory." Though deliciously addicting, you're better off reaching for natural herbs and spices instead. Why to avoid it: On the not so savory side, MSG is also an "excitotoxin," a substance that can over-stimulate neurons to the point of damage or death. People with allergies to MSG might experience burning sensations of the mouth, head, and neck; muscle tightness, fatigue, numbness or tingling; upset stomach; headaches and migraines; flushing, swelling, hives and other skin reactions. Now you can hit the grocery store and navigate those food labels with health-savvy confidence (just try not to annoy the other shoppers). Remember, if you have no idea what that "mystery" ingredient is, it probably isn't worth the risk. Happy shopping! Savor the flavor of a creamy, melt-in-your-mouth cookie full of peanut buttery goodness. Choosy moms might choose Jif, but protein lovers choose these low-carb cookies!